I think you should live with it for a while. The color is dynamic and amazing!!! Why not leave the blue but distract from it by adding to the wall? I suggest putting up some beadboard / wainscoting half way up the wall with some nice trim and painting it white. 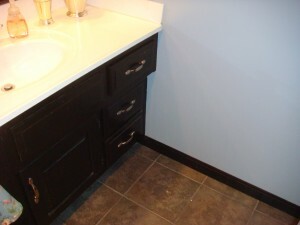 If it is a small area (as you describe) it should not be expensive. Keep us posted! You could always rag roll over it. 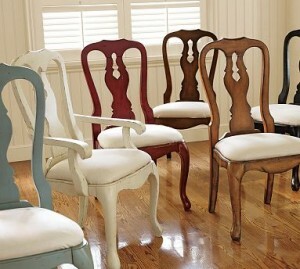 Use a white or off white and it will dull down the color a lot but still give you color. You can add more than one color to rag roll. you could do a light light gray and white. It looks marbled. I think a board and batten treatment which is similar to wainscoating will look beautiful. I think Kimba over at A Soft Place to Land has a post about it. 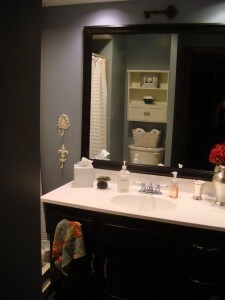 Another blueish color that looks good is Gliddens gentle tide. I don’t know about the blue either. I have 3 blue ceilings but no blue walls. But walls space is nice to have in a little room. Can you fill them up with art? 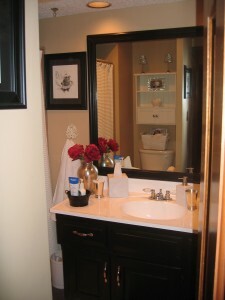 It’s great when a guest bath is a surprise - a little jewel box. I love it. In fact I may need to copy you… what is the exact color??? 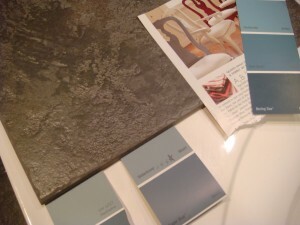 Finding just the right shade of soft blue is one of the most difficult tasks I know of…seriously! But huge KUDOS to you for taking that leap. I think you should try again. Don’t go neutral. I bookmarked a color I fell in love with in BHG last year. 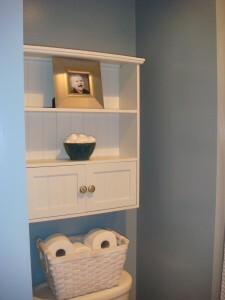 It is a soft grey blue called Quiet Moment by Benjamin Moore. It was in the October 2008 issue in the article “Fully Booked”. Take a look and see what you think. I think it would be neutral enough for you and a bold step all at once. 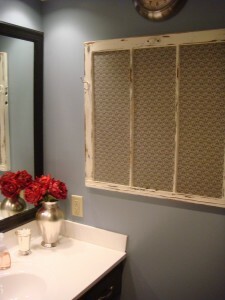 Oh, I really like the blue, but I agree with the other posters who suggested beadboard halfway up to break up the blue. I think it would look stunning! You crack me up Katie! I think it looks good but knowing you I totally understand where you’re coming from. I agree with what someone else mentioned, would it be better if you added some moulding be it white beadboard or something to break up some of the blue? BTW, need to get together soon. Miss you!